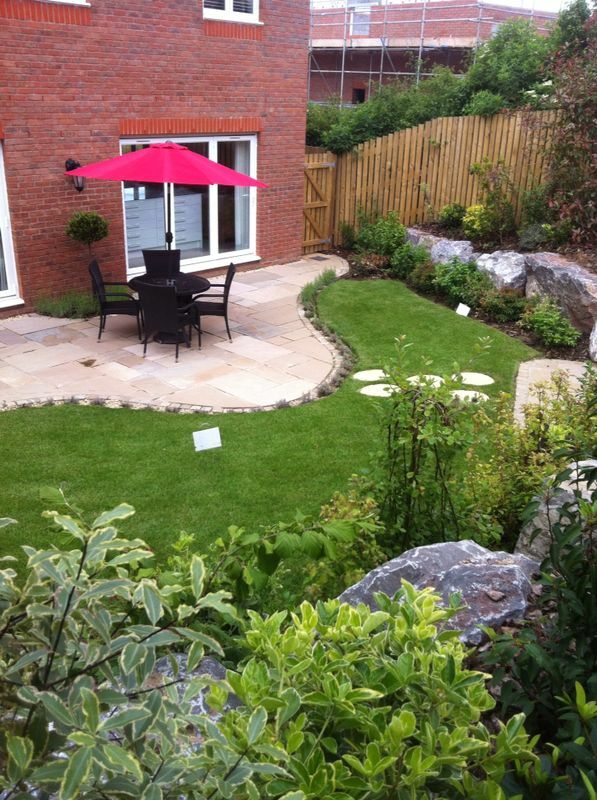 Now lets take a look at the show home gardens in all their glory! We are very happy with the results and so are our clients. These 5 pictures are of the upper level garden. It shows all the seperate elements, the circular decked patio, the stepping stones llinking it to the cicular cobbled water feature area and also the wooden planters. This garden is completed with the beautiful variety of plants and shrubs. These steps and boulders are what link the two levels. The boulders and log roll has been used to retain the soil and once again beuatifully planted to give continuity between the two gardens. The steps lead down to the lower level garden, there is a sandstone base which is linked by stepping stones to the large sandstone patio, again ensuring continuity between the two gardens. This in turn is also linked with stepping stones to the large wooden gazbo. The outstanding planting completes this garden. The whole project turned out just as planned and I really dont think that this blog can do justice to how wonderful these gardens look!